Ashton-Woodenbridge (also known as Ashton-Wooden Bridge and Pennypack) is a neighborhood in Northeast Philadelphia, in the U.S. state of Pennsylvania. 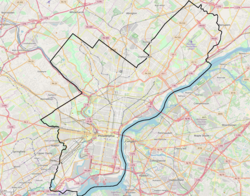 It is located on the eastern side of the far northeast, in the vicinity of Northeast Philadelphia Airport, including Wooden Bridge Run west to Academy Gardens, and south to Pennypack Park. Originally farm land, it was part of the holdings of Thomas Holme, surveyor for Philadelphia's founder, William Penn. The area was part of one of the original townships, Lower Dublin Township, until the 1854 Act of Consolidation incorporated it into the City of Philadelphia. Holme emancipated his slaves upon his death, and their descendants owned much of the area. Remnants of their community can still be seen near present-day Holme Circle, where stood a village formerly called Harrisburg. Their tiny Bethany A.M.E. Church, located on Ashton Road, at least unofficially rivals Mother Bethel A.M.E. as the oldest African-American church. "Woodenbridge" is from Wooden Bridge Run, a creek that flows through the north of the area, a tributary of Pennypack Creek. The name "Ashton-Woodenbridge" first came into use in the 1970s  to honor the Ashton Family whose progenitor settled in the area in 1653 before William Penn. Joseph Ashton's Farm, River Dale, on the Delaware River, is now the Torresdale Filter Plant . Other Ashtons settled up the Pennypack Creek in and around Ashton Road. The area has long been served by freight railroad, and there remains active industry in the area. Crown, Cork, and Seal was a long-time anchor on Ashton Road, finally relocating their world headquarters north on a large campus. Northeast Philadelphia Airport lies at the north end of Ashton Road at Grant Avenue. Originally a World War II airbase, it now serves as a general-aviation reliever airport for Philadelphia International Airport. Despite having no scheduled passenger service, it is the sixth-busiest airport in Pennsylvania. The area was settled in earnest by veterans of World War II during the dramatic expansion of the Northeast. The housing stock is primarily twins, row homes, townhouses, and apartments. ^ Philadelphia Airport System. "Philadelphia Northeast Airport". City of Philadelphia. Archived from the original on 2009-04-17. This page was last edited on 25 February 2019, at 06:24 (UTC).